That evening, when I came to the Pavilion, I found Terri waiting there. Adams soon came in as well. Pema Pera: It’s a nice place, that Dakini built for us, don’t you think? Fred and Pia showed up, followed by Dakini. Dakini Rhode: may i join you for a few minutes? Pema Pera: what a question! Pema Pera: we are (reluctantly) willing to let you go any time Dakini! FX1-Black V1.0 (High Prim)_v4: Must clear coffee cups before making another. Pia Iger: I know what you mean. Friedrich Ochsenhorn: terri:- i could guess, or wait for the blog post, but what were you talking about practicing? 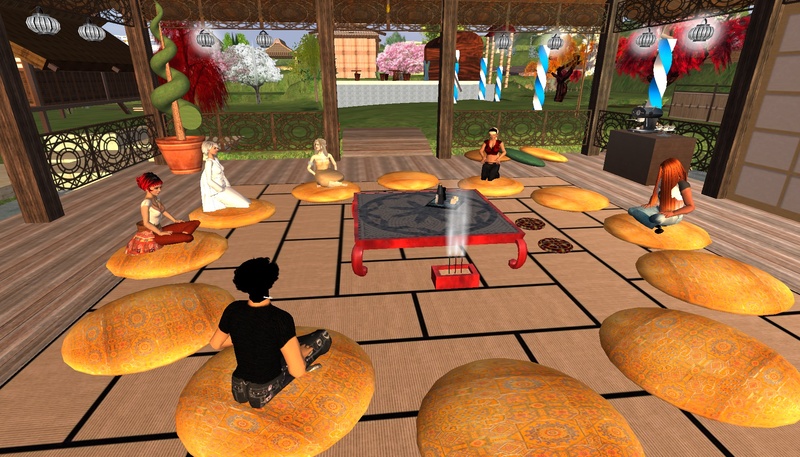 The conversation moved to SL activities. Windchime Bronze 12: Friedrich Ochsenhorn picked the option ‘Sounds’. Windchime Bronze 12: Friedrich Ochsenhorn picked the option ‘Sound 1′. Dakini Rhode: have ppl seen the new default avatars? Windchime Bronze 12: Friedrich Ochsenhorn picked the option ‘Volume’. Windchime Bronze 12: Friedrich Ochsenhorn picked the option ‘100%’. Pia Iger: yes. I read it on website too. Pema Pera: it works retroactivly? Pema Pera: so we get it into our libraries too? Taigh had joined us, and I pointed to the PaB blog. Pema Pera: Taigh, is this your first time here in this group? Taigh was about to leave, but had another question about the area. Taigh String: who is the person guarding the entrance? Terri Holrych: the giant buddha? Dakini Rhode: the kuan yin statue? Dakini Rhode: then, which buddha? The talk then went into various directions. Pia Iger: did you talk with him? Friedrich Ochsenhorn: blah. one of these weeks i’ll manage to shave. Friedrich Ochsenhorn: i cna’t believe i have to worry about that here! Pia Iger: what are the blue/white spiral outside? Dakini took off, and so did Taigh. Pia Iger: Adams, you spent whole day in SL? Pia Iger: I only can do it a few hours. Pema Pera: good seeing you all here in this new place! Pema Pera: do you have chat log saving enabled by default? Pema Pera: into one big file? Pema Pera: can you open that window? Pema Pera: do you see that? Solobill Laville: Thanks for the tip! Pema Pera: okay, bye all! Pema Pera: can someone send me the log of the rest of teh session? Pema Pera: Thank you, Pia! I left, and later Pia would send me the rest of the chat log. The comments are mine. Solobill Laville: it was a great field trip! Adams Rubble: you are welcome-did you all go last night? Pia Iger: I enjoy the trip with group. Solobill Laville: It was a first: PaB field trip! Friedrich Ochsenhorn: did you have to get permission slips signed? Solobill Laville: But I did bring my backpack! Pia Iger: oh. even went with teacher? From school children’s trips back to Adams’ blog, and onto twitter. Friedrich Ochsenhorn: so Adams, i was peeking at your blog - you’re working hard! Friedrich Ochsenhorn: how do you take notes? do you carry around a small notebook and pen everywhere? Pia Iger: so you can write everywhere. Pia Iger: Fred, do you do research of on-line behaviors? Friedrich Ochsenhorn: sorta. i dabble. The conversation went to the guide lines that Fred had mentioned in the guardian email group. Pia Iger: I like your points of our meeting guidelines, etc. Pia Iger: I think it would be better for us to have some structure in meetings. Solobill Laville: Fred, did you post something about that? Pia Iger: I just think we spent a good hour here. maybe it helps for us to deepen conversation, or focus. Solobill Laville: in a supportive group setting, no? Solobill Laville: Or are there other guidelines? Pia brings up another possible way to focus the discussions in the group. Pia Iger: Also Pema is thinking to have 2 or 3 people talk in first 30min , then group discussion. Pia Iger: so we can really go deeper in one subject, so to speak. Friedrich Ochsenhorn: sorry, was that cynical? Pia Iger: we need that cynical!! Solobill Laville: Pema can pilot it, Fred! Pia Iger: yes, people suppose to volunteer. Friedrich Ochsenhorn: i agree, on the both ways. spontenaity is beautiful, but sometimes it scatters in the wind. bredth vs. depth sometimes, too. Pia Iger: yes, different session, different format. Friedrich Ochsenhorn: for me, its less the structure vs. unstructure, than the repitition. Adams Rubble: you see too much repitition? Fred talked about his PaB experience. Adams Rubble: How long have you been in PaB Fred? Friedrich Ochsenhorn: so, cut it in half or thirds? Solobill Laville: and with that agreement, good night to you all! Pia Iger: good night, Solo. Friedrich Ochsenhorn: but, i get restless easily. Solobill Laville: bye for now! Always glad to hear how PaB has made a difference! Pia Iger: we can talk about that next time. Pia Iger: I did not notice? Friedrich Ochsenhorn: heh. well, at least i tried. Pia Iger: It shows how “being” interpreted differently by individuals. A brief discussion of philosophy. Friedrich Ochsenhorn: i really need to take the icaurs guidlines to heart! Pia Iger: to me, Philosophy, religion, spritual has some common ground. Pia Iger: I like to hear different voices here. Pia Iger: So bring it on. we like to hear your angles. Pls come often. Adams Rubble: Now I must go. Pia are we done as far as the log is concerned? Friedrich Ochsenhorn: cool - one of you have it?